Headaches and tiredness affect many people as they recover but often improve over time. If you’re worried about any symptoms ring your consultant or GP. Contact your HSE Health Centre for the Public Health Nurse, Home Helps, Personal Assistance, Occupational Therapy, Physiotherapy, Speech and Language Therapy, Day Care, and Respite Care. Contact your HSE Local Health Office for the Disability Manager, Older Persons Services Manager, Counselling, Psychology, Mental Health, Social Work, Dietician, dental, foot and eye clinics. HSE Infoline t: 1850 24 1850 w: www.hse.ie. Medical Card, GP Visit Card, and many other schemes can help with costs if you are on a Social Welfare payment, a low income, or have particular medical needs. Ask your Hospital Social Worker or call Citizen’s Information on 076 107 4000. Note: Medical card holders are usually given priority for HSE community services due to limited resources. However, if you don’t have a medical card, you’re still entitled to apply for most services. Stroke Helpline t: 1890 432 787 w: www.stroke.ie. Epilepsy Ireland t: 01 455 7500 w: www.epilepsy.ie. NCBI has services and support if your sight has changed. t: 01 830 7033 w: www.ncbi.ie. Speech and Language Therapists for communication and swallowing. t: 01 872 8082 w: www.iaslt.ie or www.isti.ie. Try out the accessibility features on your phone or computer. Ask your Occupational Therapist or Speech and Language Therapist for advice too. Assist Ireland has information on aids for daily living, mobility and communication. w: www.assistireland.ie t: 0761 079 200 e: support@assistireland.ie. 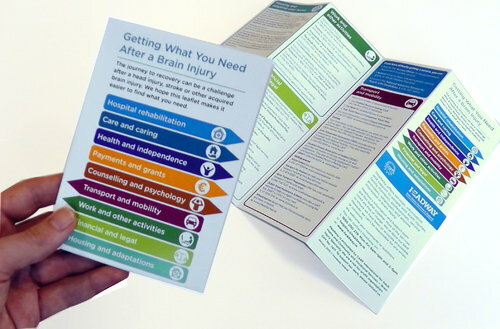 Acquired Brain Injury Ireland offers assisted living, case management and community rehabilitation services. t: 01 280 4164 w: www.abiireland.ie.